Good news, Zara lovers: Zara Home is coming to Canada, which means soon you'll be able to bring the Spanish-based retailer's on-trend (and budget-friendly) style to your bedroom, living room and bathroom. Set to open its first Canadian location at Toronto's Yorkdale Shopping Centre the Zara Home store will feature moderately-priced, fashion-forward housewares as an offshoot to the Zara brand. So what exactly does the ubiquitous clothing chain offer for home décor? 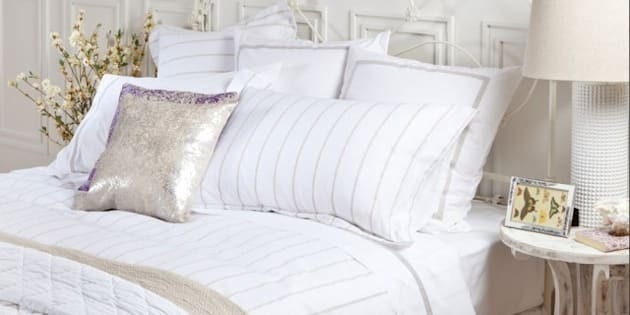 Stylish bedding, dinnerware, mirrors, vases, candles, pillows, drapes, rugs, towels, stationary (to name a few!) with all items ranging from $2 for a napkin to $500 for a cowhide rug. Currrently, Zara Home isn't even available in the U.S., though they do have an online store -- that's right, Canadians get first dibs. Zara has been giving Canada a lot of love lately, having also announced the launch of a Canadian online store last month. The Yorkdale Shopping Centre also announced on Monday 12 other brands that will call Yorkdale home in 2013, including All Saints, David Yurman, John Varvatos, Mulberry and even LEGO.